SXSW Center is a 13 story iconic landmark in Downtown Austin created to be a physical manifestation of everything SXSW and Austin has to offer. Designed by world-class architect Pei Cobb Freed & Partners with architect of record services provided by Gensler, The building’s Class A finishes, activated lobby, unique column free-layout, and rooftop garden provide a one-of-a-kind environment for tenants and visitors to create and collaborate. Serving as the gateway to SXSW Center, The Plaza is situated within a large grove of stately live oak and pecan trees. Complete with raingardens, an outdoor deck and cutting edge landscape architecture, The Plaza provides a serene environment for tenants and guests to relax, recharge and enjoy. An activated lobby and ground floor is designed to reflect the innovative spirit of Austin with both indoor and outdoor work spaces available. The building lobby is designed to function as a gathering place to foster creativity and encourage the mix of ideas between tenants and guests. A coffee bar will offer a menu of drinks and grab and go meals making it an ideal place to grab your morning coffee, a mid-day snack or an after-work drink. SXSW Center offers unmatched amenities to make life easier and support active living. Utilize the on-site gym to complete a quick workout. Afterward, take advantage of spa quality locker rooms complete with spacious showers. With more commuters choosing to avoid traffic congestion and utilize alternative transportation to get to work, SXSW Center is conveniently located between the main North-South Capital Metro Bus Routes through Downtown Austin including the popular MetroRapid route. Prefer to ride a bike? Take advantage of indoor and secured storage space to secure your bicycle while you work. Electric car charging stations are available in the attached 300 space parking garage. 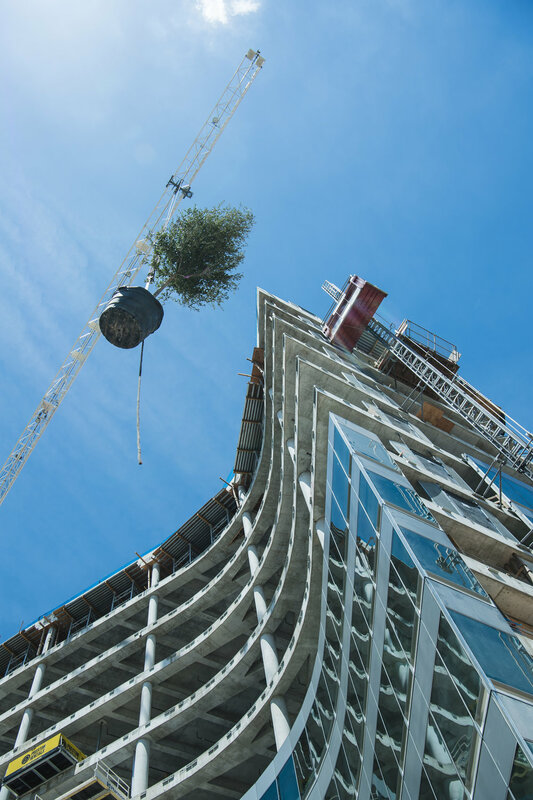 Photos from the SXSW Center topping out party on August 29, 2018.